Beams are a great way to simulate lasers, lightning, or any type of similar effect that needs to travel along the length of a beam. This document provides an overview of how to set up a basic beam emitter. 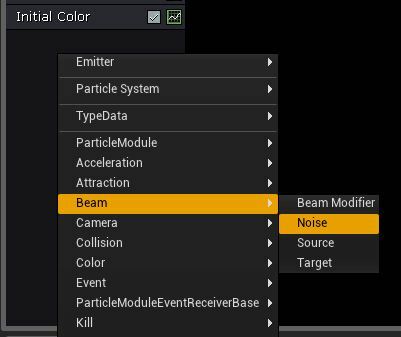 Once we have added this to our new particle system, we are ready to focus on the beam itself. 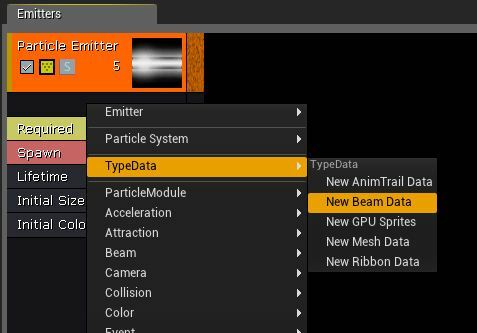 First, we add a Beam TypeData module by right-clicking in the emitter and choosing TypeData > New Beam Data. Lifetime 0.0 Allows the beam to be constant (live forever). Beam Method PEB2M_Distance The beam will be calculated via distance along the emitter's X-Axis, rather than requiring a source and target. Texture Tile Distance 500 Tiles the texture every 500 Unreal Units. 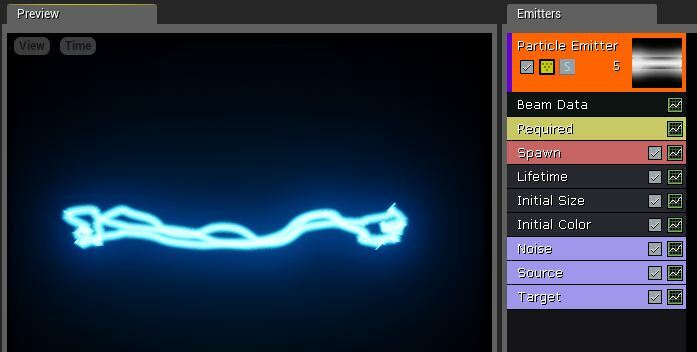 Allows animated pulses to show more clearly. Max Beam Count 3 Adds in a few more beams, which will look nice once we have noise. Speed 0 Beam will travel instantly to its target. 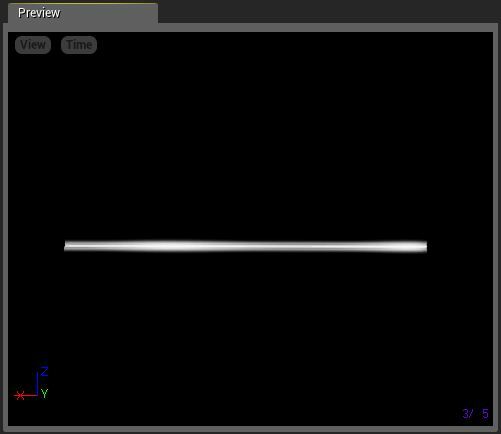 Interpolation Points 50 Gives the beam some flexibility for the addition of noise, which we will do later. Distance 1000 Extends the beam 1000 Unreal Units along the X-Axis, giving us something to work with. 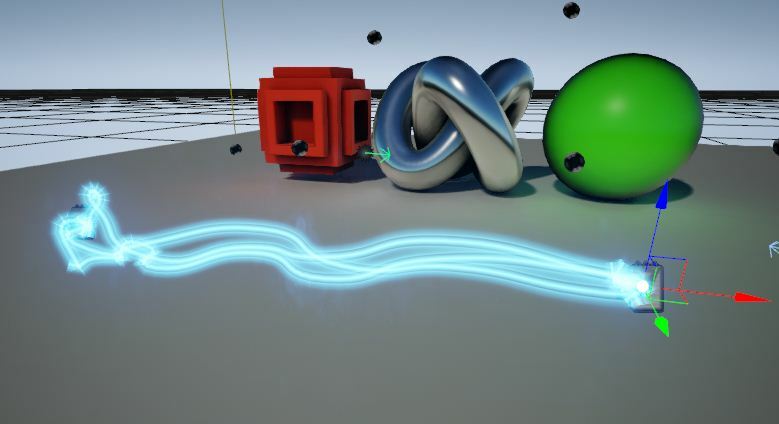 Once these properties are set, delete the Initial Velocity and Color Over Life modules. Add back in an Initial Color module. 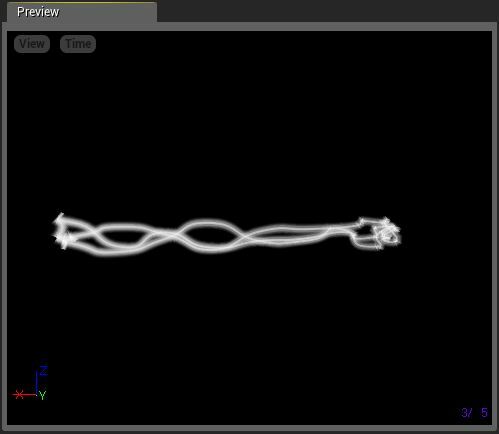 You can make a beam more visually interesting by adding some noise to it. This is done with the Noise module. This module jitters the beam around, completely changing the nature of the effect. It is found under the Beam submenu of the module context menu. Frequency 30 Gives us a nice amount of noise. Adjust to taste. Low Freq Enabled Checked Enables randomization of noise points. Noise Range Vector Uniform distribution. Min:( 0, -50, -50) Max:( 0, 50, 50) Tells the noise how far it can move away from the beam. Noise Tessellation 10 Smoothes out the noise. Frequency Distance 100 Rounds out the shape of the noise. However, this isn't always ideal. In some cases, you will want to specify a source point and target point for the beam, and control interpolation between these points. This is where you can use the Source and Target modules. First, we will add 2 actors into the scene that we can use as source points. In this case, we used Note actors. These will become the source and target for the beam. Back in Cascade, add a Source and a Target module to your emitter. These are both found under the Beam submenu. Beam Method PEB2M_Target Extablishes that the beam will require a source and a target. Source Method PEB2STM_Actor Tells the beam to start at the location of an actor. Source Name BeamSource Tells the beam to start at the location of an actor. Source Vector Constant Distribution. Value:(0, 0, 0) This sets the display source in the Preview window to be 0,0,0. Target Method PEB2STM_Actor Tells the beam to end at the location of an actor. Target Name BeamTarget This is just a parameter name and can be anything you like. Target Vector Constant Distribution. Value:(1000, 0, 0) This sets the display target in the Preview window to be 1000,0,0. Your beam will now look just like it did previously, but is now ready to have actors set up as the source and target. 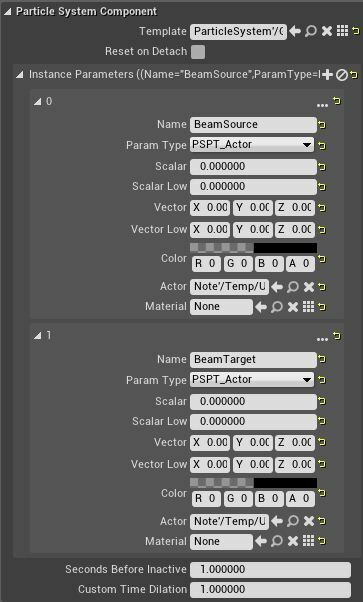 To make the beam use the note actors as source and target, we must establish them as Instance Parameters for the emitter actor. This document will give only an overview of this process. For more information on setting up Instance Parameters, please see the Instance Parameter example page. 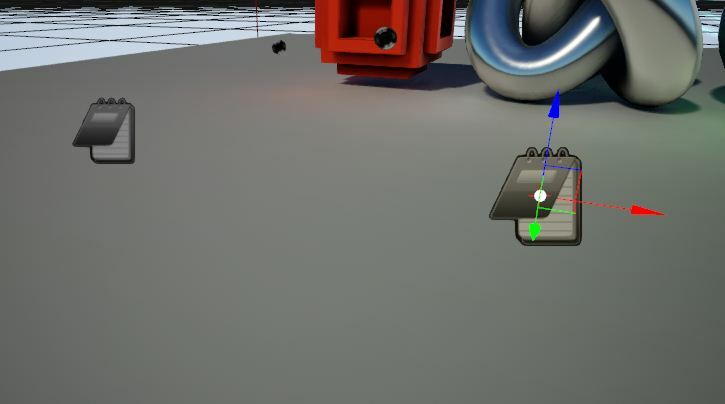 Set up 2 instance parameters on the emitter actor. Name the first BeamSource and the second BeamTarget. Set both of their Param Type properties to PSPT_Actor. Set one of the note actors into the Actor field of each parameter. This may require that you lock the Details panel for convenience. 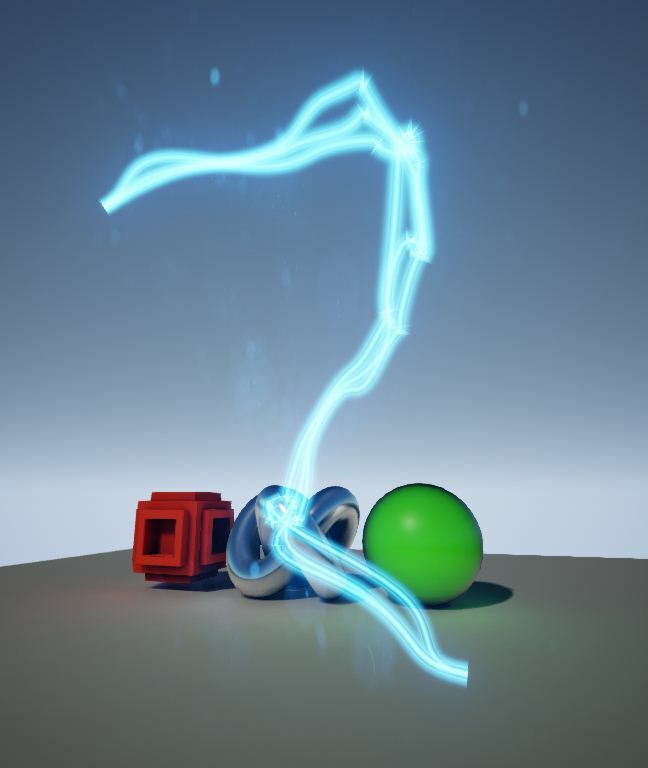 You can make the path of the beam much more interesting by adjusting the tangents of the source and target.